Designed for medium weight woven fabrics. 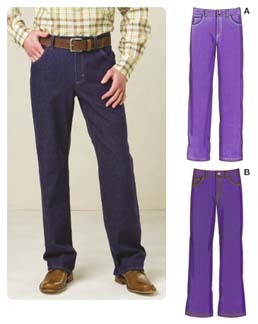 Suggested Fabrics: Denim, twill, corduroy. Men's jeans have fly zipper, waistband with belt carriers, back yoke, back patch pockets, front pockets, a coin pocket, and topstitching detail. View A legs are straight cut and View B are boot cut. Sizes Small - XXLarge included in this pattern.